"A certificate as Appaloosa Horse Club Supreme Champion will be awarded when a horse has earned at least 100 points, with at least 40 points earned in Halter classes and at least 60 points earned in Performance classes. No more than 10 points can be from one Performance class and the horse must have at least one ROM in each of the 4 categories of Performance classes. A minimum of 5 different judges is required." With the requirements established, it could be expected that a horse worthy of such recognition would be a World Champion and all around super horse with an intriguing background. In 1986, the first Appaloosa Horse Club Supreme Champion was named. And it was no surprise that the first horse so honored came from a pedigree rich in champions and champion producers. Miss Plaudette (ApHC T-108698) was a dun mare with color, foaled on April 2, 1964, bred by Jim Wild of Sarcoxie, Missouri. She had been shown in halter. Owned by Al Levin and Hadley Campbell, Miss Plaudette was in foal to Campbell's stallion, Ha Dar Honey, when she went through a sale in Sedalia, Missouri. Appaloosa breeder Harry Jackson, of Gower, Missouri, bought the mare and took her home to his horse farm where she would live out a long and productive life as an outstanding broodmare. Many of you have probably heard of another colt she later produced, Robert Redford. When I first met the old mare it was in 1985 or 1986, and although blind, she was in good shape for her age and still producing a nice foal every year. Looking at bloodlines, Miss Plaudette's dam, Bright Plaudette, was a daughter of Bright Eyes Brother F-3047. Her Quarter horse sire's pedigree is filled with the likes of Norell's Little Red, Ding Bob, Coke T 'Prince' and Norell's John Henry along with AQHA hall of famers, Joe Reed, Joe Reed II, and Leo. Another chapter will one day be written about Ha Dar Hadley's sire, Ha Dar Honey. A product of royal breeding, Ha Dar Honey was sired by the immortal Wapiti, and out of the mare Comanche T Bird, a grand daughter of Mansfield's Comanche. Ha Dar Honey's dam also traces her lineage back to Quarter horses Sheik P-11, Wimpy P-1, Old Sorrel and Peppy. Ha Dar Hadley was born in a pasture at Harry Jackson's farm near Gower, Missouri on April 27, 1975. Harry said that he was great the day he was born. It might have been that Harry knew Hadley Campbell would some day be in the ApHC Hall of Fame, or out of respect and admiration, or for whatever reason -- the name Ha Dar Hadley was selected for the colt. As a two-year-old, Ha Dar Hadley was broke to ride by a young lady, Terry Seveen, who was working for Harry at that time. While Harry showed the colt at halter and won many times, it was trainers and exhibitors such as Mike and Sandy Morris, Marvin "Butch" Carse Jr., Debbie Nicholson and Jenny Crouse who campaigned the young stallion extensively in halter and performance classes. 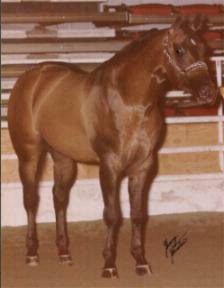 At the 1980 Appaloosa World Show, Dave Parlier piloted the horse to a bronze medallion in steer daubing. Ha Dar Hadley received Registers of Merit (ROM) for each of the following: calf roping, heading and heeling, steer daubing, trail class-senior, western pleasure-senior, hunter under saddle-senior and rope race. Other classes he won in include and Hunt Seat classes, western riding, western pleasure-junior, judged calf roping and team roping. His record includes 61 halter points, 109 performance points and he has sired at least 74 registered foals.